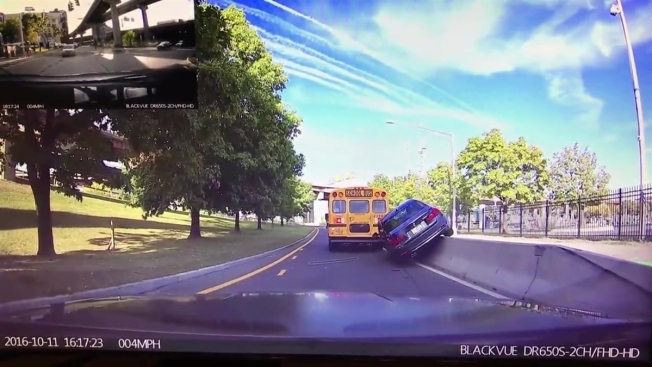 An upstate New York man crashed into a concrete barrier and turned his car on its side Tuesday after he tried to pass a school bus on the right. An impatient BMW driver was caught on video trying to pass a school bus at the intersection of Broadway and I-787 in Albany, according to NJ.com. The dash cam of a driver who slowed down to allow the school bus to merge in front of him caught the incident on camera. In a fit of road rage, the BMW tries to pass the bus, then crashed into an orange barrel and concrete barrier immediately after. The car rests on two wheels against the barrier as the driver exits the vehicle, appearing unharmed, video shows. "I thought there was another lane!" the driver can be heard saying in frustration. No serious injuries were reported, though Albany police say three children on the bus were taken to the hospital as a precaution. The driver received a ticket for unsafe passing.